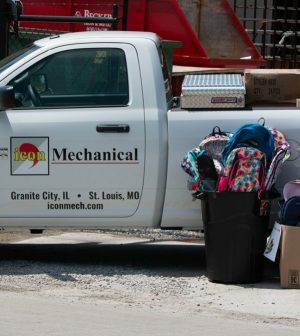 Wednesday afternoon (Aug. 2), the icon Mechanical team shared a truck-load-sized donation of nearly 950 backpacks and various school supplies with Granite City’s Twigs program. With the Twigs Back-to-School-BBQ & School Supply Giveaway event taking place this Saturday, the donation couldn’t have come at a better time. Over the past several years, icon has participated in various Twigs-related events, including yearly school supply drives, volunteering during the group’s daily summer lunch program and helping out throughout the year. Recognizing the great need of the program, icon selected Twigs as its “2018 Charity of Choice”. Granite City’s Twigs program was launched in 2011. The non-profit organization offers both a summer lunch program and school-year pack-a-sack programs in multiple communities in Illinois. The group’s mission is to help the communities they serve grow strong, healthy children by eliminating hunger and to raise awareness about the widespread problem of childhood hunger. 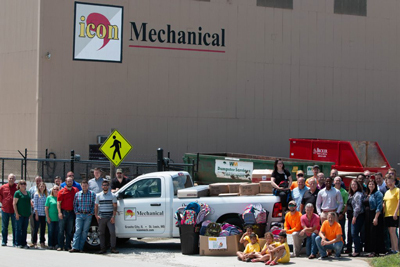 “Twigs could not be changing the lives of children in so many communities if it weren’t for the big hearts of our 600+ volunteers and community partners like icon Mechanical, said Guilliams. “Through their generosity, we will hand out over 115,000 lunches this summer.” For information on how you can help Twigs, visit twigsforkids.com. icon Mechanical is a full-service mechanical engineering and construction firm specializing in the design, fabrication, installation, modification and ongoing service of process piping, industrial ventilation and commercial HVAC. Recently named 2017’s second largest mechanical contractor in the St. Louis region by the St. Louis Business Journal, icon continues to be a forerunner of innovation, prefabrication, engineering design and construction.